This year could see solar power become the UK’s cheapest subsidy-free green energy source. Offshore wind costs are also continuing to fall as one of the world’s “Seven Sister” oil and gas giants predicts that renewables will provide 30% of world electricity by 2040. Government financial support might sound like a good thing for fledgling renewable energy industries. In practice, it is often a double-edged benefit, as the UK’s solar energy sector has shown. Now, after several years of boom, bust and fluctuating state aid schemes, the solar sector’s maturing technology and supply chains, plus economics of scale and better financial models mean that an increasing number of projects can claim to be genuinely subsidy-free. Two further coincidental factors — a glut of cheap Chinese solar panels and a replacement scheme allowing small-scale solar operators to continue selling their spare power to the grid after April — promise to make 2019 a very positive year for the direct energy received from our local star. While emphasising that oil and gas will be here for decades to come, the world’s sixth largest oil and gas “supermajor”, London-based multinational, BP, predicted in its February annual energy forecast that renewables will be the world’s main power source within two decades. BP expects wind, solar and other renewables to generate some 30% of world electricity by 2040, significantly up from its 25% 2018 estimate. In Europe, this could reach 50%; the current global figure is c.10%. While still anticipating peak oil in the 2030s — or 2020s at the earliest — BP sees green energy entering the global energy system faster than any fuel in history. Its well-informed crystal-ball gazing reveals more. A faster world low-carbon transition could bring the 2040 time horizon down to 2025, which would be “literally off the charts”. However, in tandem, BP says that substantial investments will be necessary to produce the oil and gas needed up to 2040; it then expects daily global oil and gas demand to be 80–130 million barrels compared to some 100 million today. The National Grid estimates that the UK could have an 18GW solar capacity by 2030; end-2017 installed capacity was 12.8GW. In comparison, by mid-December 2018, UK installed wind energy capacity was calculated as 12.3GW onshore and 7.9GW offshore, making the UK the world’s fourth largest wind power generator. China is the world’s largest solar power installer with 52GW in 2017. Any form of low-carbon energy must be able to stand firmly on its own commercial feet. After patchy “incubation” support from central Government, both offshore wind and solar energy are now competitive. In fact, with rapidly falling costs, the two are said to be in a close race to become the UK’s cheapest renewable energy resource, with prices more attractive than anything oil, gas or coal can offer. The Financial Times reported in September 2017 that since 2012, offshore wind energy costs had fallen by nearly a third to an average of £97/MWh — four years ahead of schedule — largely due to advances in technology, economics of scale, fast supply chain development and improved finance. Offshore wind gained a state-guaranteed “strike price” for its output under for the Contract for Difference (CfD) scheme in Government energy auctions, overtaking nuclear. Solar energy is on a similar cost-reduction path but not currently eligible for CfD. Many people want this to change. A relaxation of planning constraints could put offshore wind in pole position within a decade as new ultra-large 8MW turbines currently being deployed are giving way to larger 10MW and 12MW models. However, solar energy costs are predicted to take an early 2019 lead. Two further factors are important for solar parks and individual installations designed to be profitable for 30 to 40 years. As already mentioned, China is releasing a slew of cheap solar panels on to world markets after cutting its own huge solar programme. This follows a September 2018 end to EU price tariffs introduced in 2013 to protect the European market from low-cost Chinese solar imports. However, there is also good news for small solar array operators too. The Government’s Feed-in Tariff (FiT) for solar — which pays for spare power sold to the National Grid — ends in April 2019 but will be replaced by the new “smart export guarantee (SEG)” that encourages low-carbon energy use. 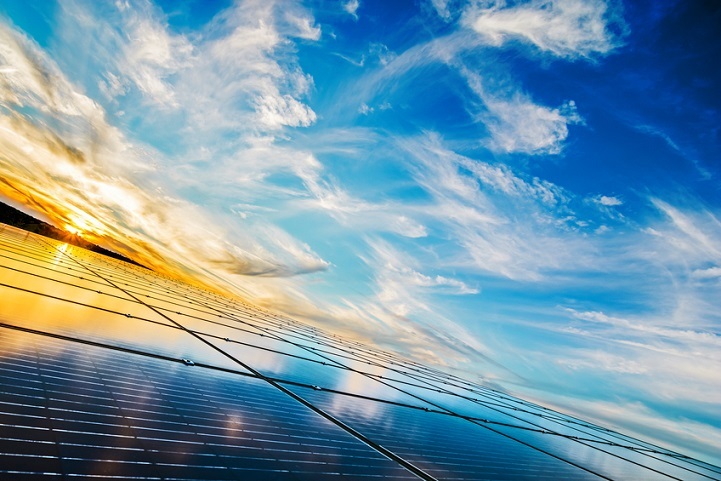 The Solar Trade Association’s (STA) updated assessment of the solar levelised cost of electricity (LCOE) — defined as the cost of electricity over a project’s lifetime — concludes that solar is on track to become the UK’s cheapest form of energy. STA estimates that solar LCOE during 2019 will be £50/MWh–£60/MWh, far lower than the £80/MWh forecast in 2014 and competitive against natural gas and onshore wind. STA says this could fall to £40/MWh by 2030, and through technology, auctions, networks access and a climate change levy exemption, it wants to see a level playing field with other energy sources. Renewables have already been very positive for the UK. A Carbon Brief analysis shows a 38% fall in the UK's total carbon footprint since 1990 which could have doubled without the green revolution. In 1990, coal took 67% of the UK's energy mix but fell to 5% in 2017. Government figures suggest the UK’s total 1900 carbon footprint was 600 million tonnes of CO2 (MtCO2) but fell to 367MtCO2 in 2017. However, the second-largest contributor (31%) was lower industrial and residential sector energy use as people turned actively to LED lighting, electric heating and other energy-efficiency measures. In September 2018, Energy and Climate Change Minister, Claire Perry, opened Anesco’s 10MW Clayhill project in Bedfordshire, which was promoted as subsidy-free and includes 6MW of battery storage; grid balancing services to the National Grid qualify for extra payments. A Development Consent Order (DCO) application has been made for the subsidy-free 350MW Cleve Hill Solar Park in Kent — a Nationally Significant Infrastructure Project — again with battery storage. Ditto a DCO for the 150MW Little Crow development near Scunthorpe — with 90MW of battery storage. The Westcott Venture Park in Aylesbury should export subsidy-free industrial solar energy when a 15MWp (megawatt peak) 60,000-panel solar array is added to its existing 1.6MWp unit. Built with Government support in 2011, this is reported to have prevented more than 4300 tonnes of CO2 emissions. New construction starts in summer 2019. A Solar Media research team has analysed the sector’s status. Adding real and removing speculative schemes, it calculates the number of “live” projects in the UK pipeline to be about 130, ranging from 250kW to 350MW and with a 2.53GW total capacity. It further estimates that about half have full planning applications submitted; the other 50% are not yet in planning. Three-quarters come from the subsidy period. The team expects the “live” post-subsidy list to keep on growing. During 2018, it calculates that between 110MW and 120MW was installed and that this could expand post-subsidy to between 300MW and 600MW in 2019. Renewable energy makes increasing environmental and commercial sense for companies. After a difficult sector incubation period, solar energy production costs, like offshore wind energy, are falling and becoming financially competitive without Government support. A temporary global glut of cheap Chinese solar panels, plus a new scheme allowing small businesses to sell spare energy from on-site solar panels to the grid, potentially make this is an opportune time.